, it just doesn't make sense to sacrifice your diet's nutrient density by including low-nutrient grains. A grain free diet is the way to go. The majority of grains, including wheat, include gluten, a sticky protein composite that wreaks havoc on the bodies of a many people. 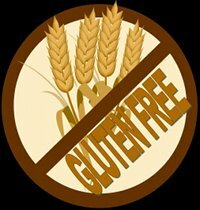 Gluten is the cause of coeliac disease, an autoimmune disease in which the intestines are gradually destroyed, eventually limiting a person's ability to absorb nutrients from their food. It's unclear exactly how many people suffer from coeliac disease, but it's widely acknowledged that whatever the number is, it's a common ailment and the majority of those suffering from it have never been diagnosed. Some of the more moderate estimates of its incidence rate are 1 out of every 105 people (5), but some medical researchers place it closer to 1 in 70. The older you get the more likely you are to suffer from the disease, with an incidence rate for people over the age of 52 pegged at 1 in 47 (6). Another autoimmune diseases caused by gluten is dermatitis herpetiformis, which causes horrible skin rashes. In both diseases, a completely grain free diet causes the diseases to disappear completely. But a huge chunk of the population is what's called gluten sensitive, a catch-all phrase for a wide variety of conditions and symptoms now believed to be at caused or worsened by gluten in the diet. Many of them are related to degeneration of digestive ability, skin, or the intestines. Estimates of gluten sensitivity range from 30 percent of the population to as high as 50 percent (7). This barely touches the surface, and as time goes on grains are being fingered as the cause of a wide variety of diseases. In my own life, I was only able to get rid of the colitis I suffered from when I removed all grains and starches from my diet. A Grain Free Diet: What's The Alternative? Because grains wreak havoc on the bodies and minds of a very large part of the world's population, it's clear that people would do well to avoid them. Meat, Eggs, And Dairy: Animal foods aren't a good replacement for the ones you'll give up when you switch to a grain fee diet. Meat is well known for it's ability to cause variety of diseases, and eggs and dairy are no better. Stay clear of animal foods. High-Fat Foods foods such as oils, avocados, nuts, seeds, and margarine: High-fat foods don't make for good options on a grain free diet in more than minor quantities. A high-fat diet causes all kinds of problems, including high-blood-sugar-related issues like diabetes. While nuts and seeds a great in small quantities, processed fats like oil and margarine should be completely avoided. Cooked Foods In General: Any sort of cooking is going to seriously degrade the nutrient content of a food, derange it's protein so it's hard or impossible for the body to use, and bring about a host of other problems. It makes sense to avoid any cooked food. Vegetables: Raw vegetables are of course incredibly healthy and you should eat a lot of them, but the problem is they're so low in calories and high in volume that it's virtually impossible to get enough calories to live off of while following an all-vegetable diet. Many people use fats to add to the calories of grains, but as we discussed above, that doesn't work. So now that we know what won't work, but what will? The answer may not seem like the obvious choice, but it's a fantastically rewarding one. Fruit is actually the food choice that makes the most sense for use in supplying the majority of our calories. It's low in toxins, is know to prevent many diseases, and it's also incredibly satisfying. It's the food we evolved eating in the tropical forests where our species had it's start, and we're still adapted to thrive on it today. A healthy low fat raw food diet gets most of its calories from fruit, but also contains plenty of raw vegetables and a few raw nuts and seeds. This diet will help you prevent aging, overcome your health problems, and open up a new realm of vitality for you. Learn how to get started on a raw food diet today. Decided to go with a grain free diet? Figure out what foods you should choose and what ones you should avoid. (2) Zagon IS and McLaughlin PJ (1991) Brain Res. "Identification of opioid peptides regulating proliferation of neurons and glia in the developing nervous system." (3) Dohan FC and Grasberger JC (1973) relapsed schizophrenics: earlier discharge from the hospital after cereal-free, milk-free diet. Amer J Psychiat 130:685-686. (4) Schuppan D, Junker Y, Barisani D "Celiac disease: from pathogenesis to novel therapies". Gastroenterology 137 (6): 1912–33. December 2009 doi:10.1053/j.gastro.2009.09.008. PMID 19766641. (7) Braley, James M.D. Ron Hoggan, M.A. and Jonathan Wright. “Dangerous Grains: Why Gluten Cereal Grains May Be Hazardous To Your Health” Avery Trade (August 22, 2002).